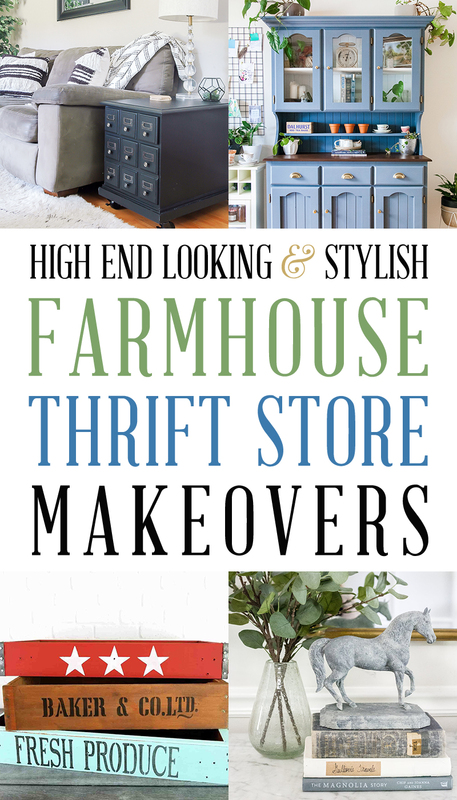 It’s time for some High End Looking & Stylish Farmhouse Thrift Store Makeovers. You are going to love this weeks selection… it’s filled with creations that look like they came out of either a boutique or a high end Furniture Store. From Furniture to Wall Art to Statues… you are going to eat all of this goodness up and store it in your thought vault for future projects. 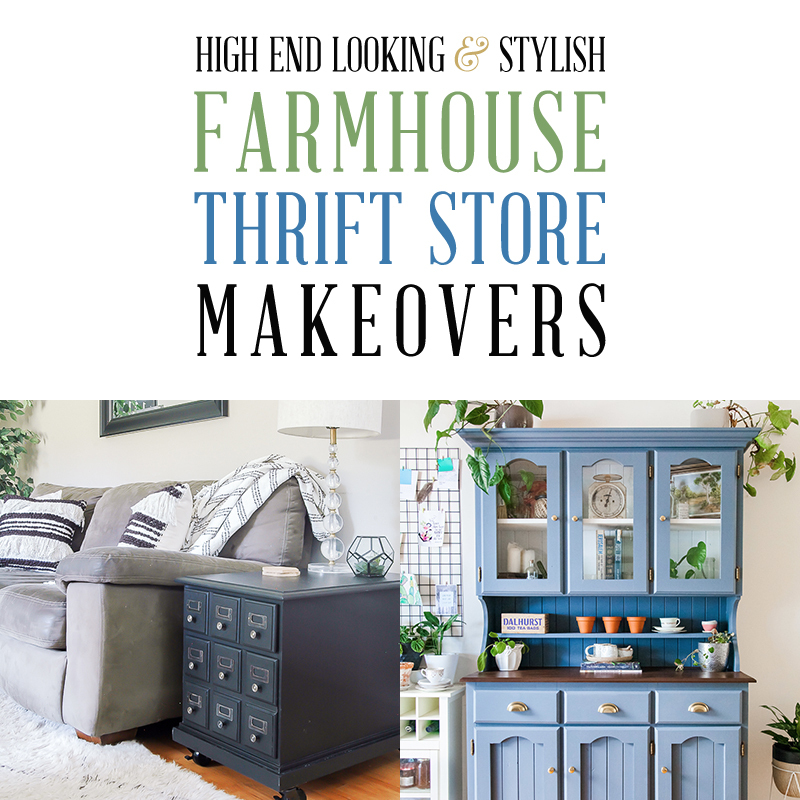 As always… kick off those shoes… grab a cup of your favorite brew … curl up on the couch and enjoy these original Thrift Store Makeover Creations and be totally inspired! Ok… this is Brilliant!!! Really. 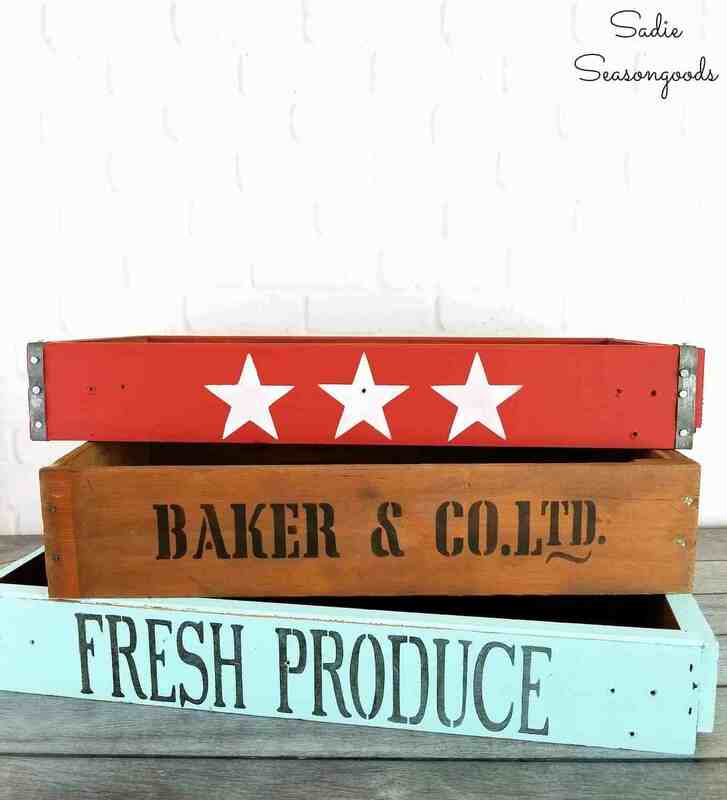 You know how “crates” are always in demand by everyone that loves Farmhouse Style…well Sarah over at Sadie Seasongoods has come up with a way that we can all make our crates to our own style preferences. How you ask? By upcycling old drawers! Yep…she is going to show you how to take discarded old drawer to beautiful Farmhouse Crates you will absolutely love…fill them… stack them… store in them… anything that makes your little heart happy. Keep your eyes peeled for those discarded drawers of all sizes… you can never go wrong by collecting old drawers…there is such a plethora of things to make with them. I have literally made a U turn to get to a dresser road side and snatched the stack of drawers next to it …I felt bad because I didn’t take the whole thing but there are so many way to repurpose a dresser without drawer I forgave myself and I got a treasure trove of drawers. Don’t be shy… pick them up any where you can : ) Now hop on over and visit with Sarah and see how she made these! Lauren over at Bless’er House has a real treat waiting for you! Wait till you see what she does with a Thrift Store Horse Toy…it’s no short of amazing! 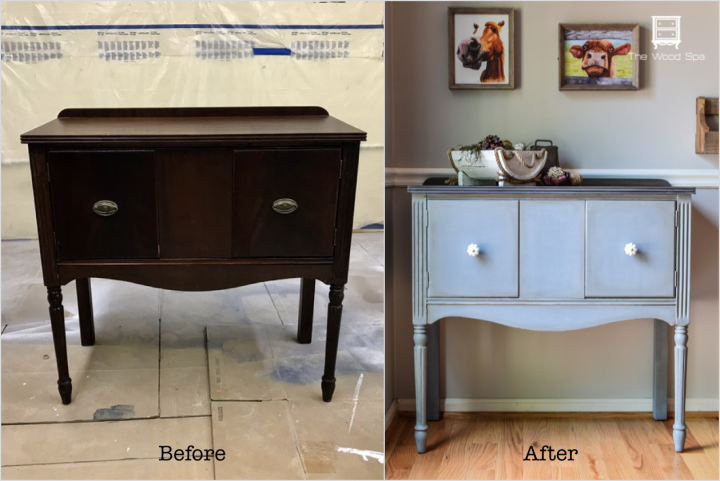 You have to visit and see how this once loved… then discarded toy got a brand new life and looking fabulous starring in this beautiful Vignette! Just think of what you could turn into one of these sculptures…run… don’t walk to get the simple DIY! 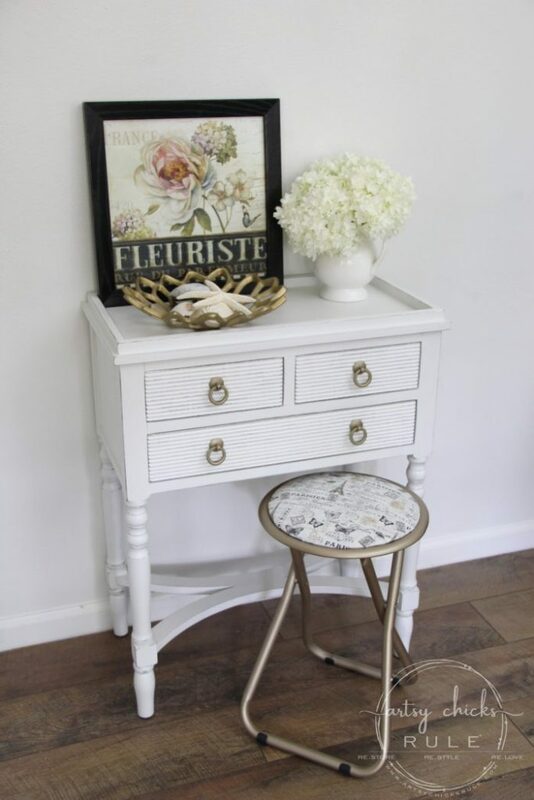 Over at Simply Beautiful By Angela … Angela is going to show you how she transformed 5 Thrift Store Finds into Farmhouse Beauties… you are really in for a treat when you visit. I just love how she took 5 completely different items and brought them all together to live in harmony! Do you remember when Larissa came home with the dated Geese Stool and the 80’s Benches? Well she also brought home an 80’s Sewing basket and decided to give it a whole knew updated Farmhouse Look and WOW did she do that! You have to see how she took it from antiquated to Farmhouse sophisticated! Hop on over to Prodigal Pieces to experience Larissa’s Magic Touch! Now it is time to visit The Whimsical Wife where you will watch an old dated hutch turn into a Modern Farmhouse Hutch that is incredible! I love that it will add a beautiful POP of color to a space and it can be stylized with tons of charm. Do not miss out on this one. 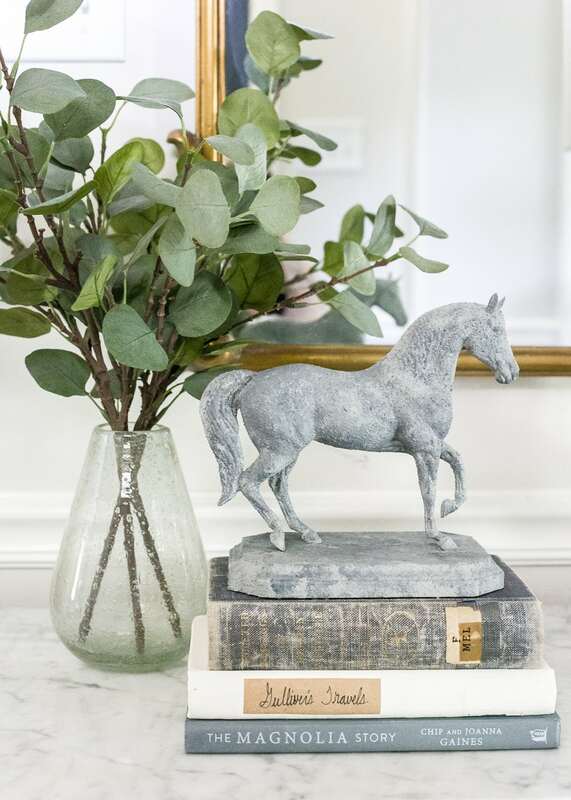 What I really love is how totally different the piece is…you will know what I mean when you see it… it gives you so much insight on what is possible every time you pick up an old item… there is truly something fabulous waiting to be born. 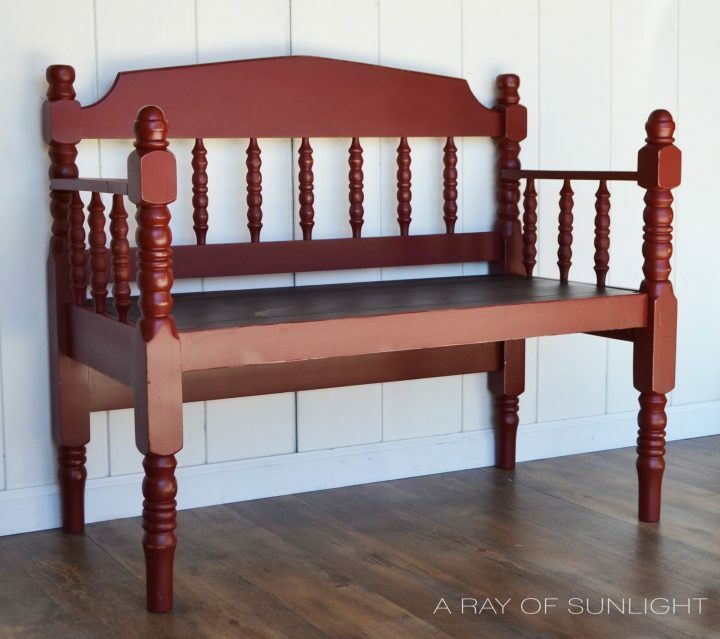 Natalie is going to show you how to make the most adorable Red Farmhouse Bench from a Thrifted Headboard! 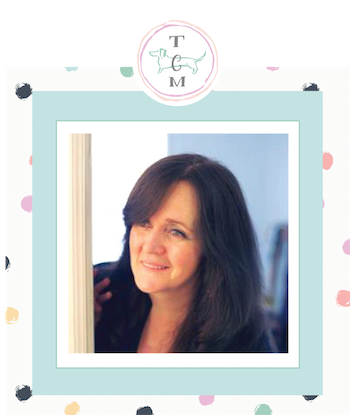 She will show you step by step and totally inspire you to find a headboard set asap. I just love when a plan comes together don’t you. Check out her wonderful work over at A Ray Of Sunlight! I had to feature this beauty once again…mainly because it is totally incredible plus the Summer is coming to an end and I have a feeling that some of the ceiling fans are going to wind up at the Thrift Store so you might want to keep your eyes peeled… who know you just might get lucky and score one. 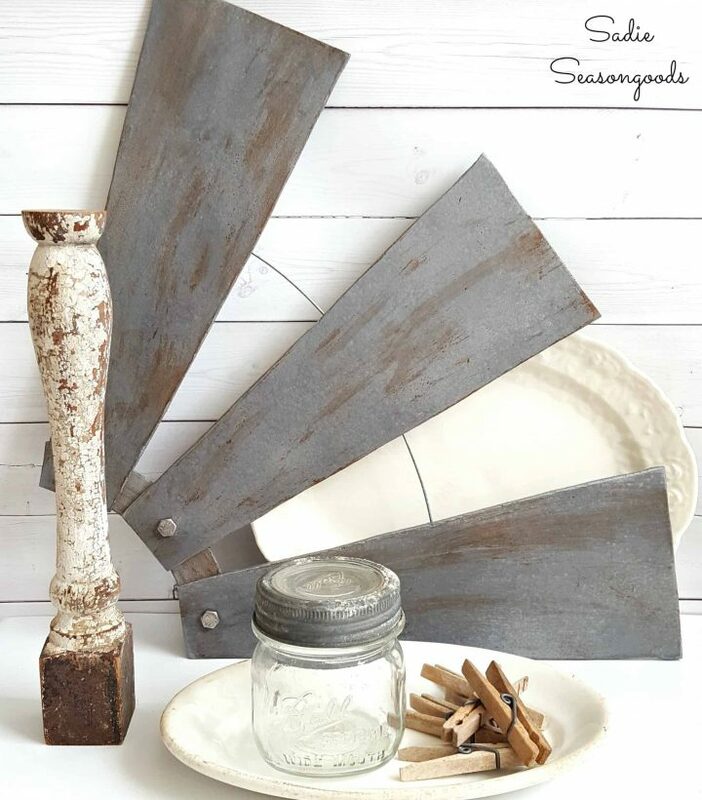 You have to come on over to Sadie Seasongoods to see how Sarah transformed so very dated Ceiling Fan Blades into this fabulous Farmhouse Windmill Wall Art…I mean Joanna Gaines herself would hang it in her home! Check it out and enjoy. 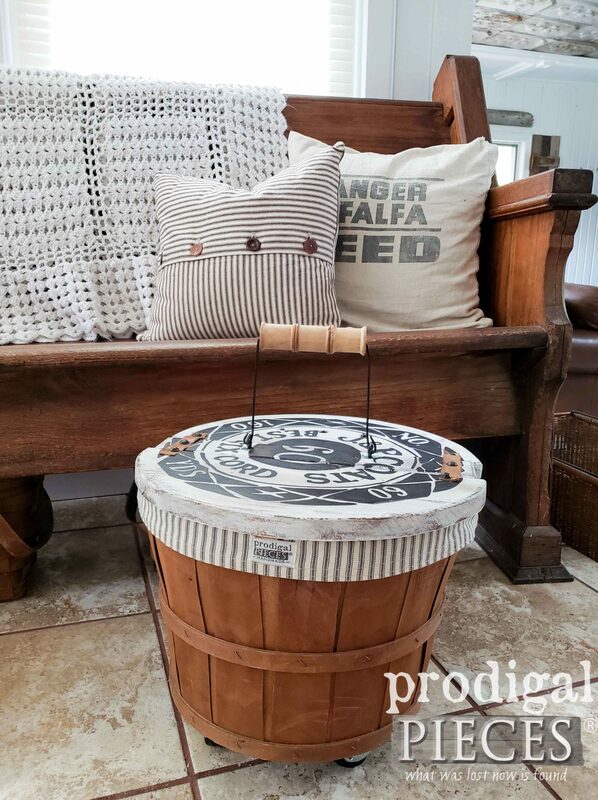 Nancy from Artsy Chicks Rule is going to show you how she turned an old stool into a Fun French Farmhouse Stool in no time at all! 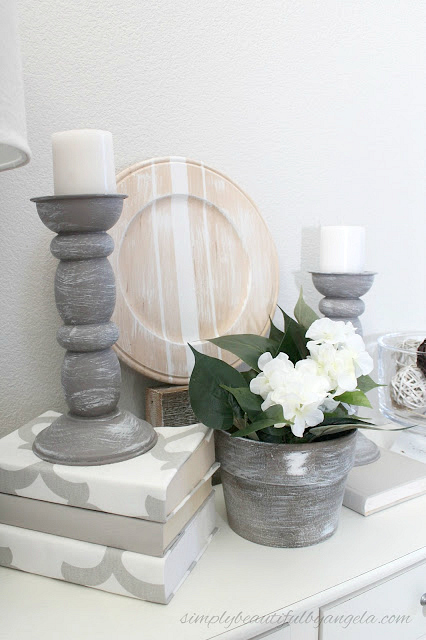 See how she did it and then you have the tools to turn all kinds of stools into your ideal Farmhouse Piece! Ooo la la! 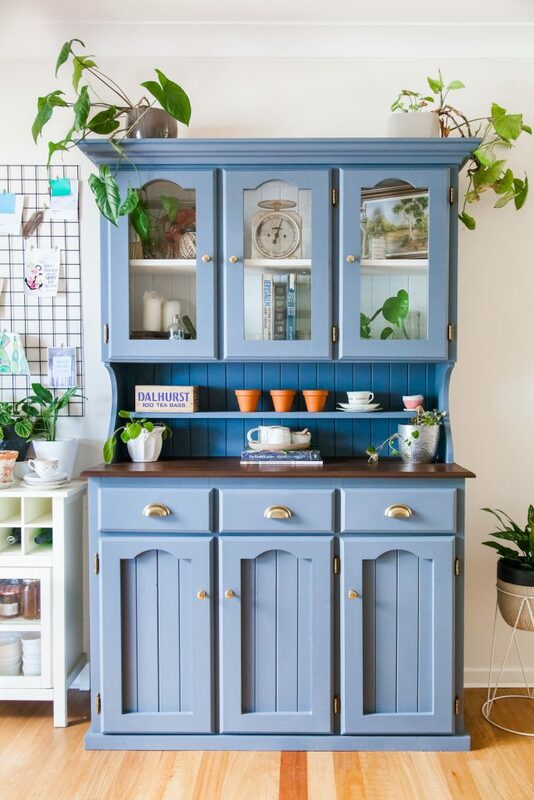 Pat over at The Wood Spa is going to show you how she turned this little cabinet into a Farmhouse Princess! You won’t believe how simple it was…but just look at her now. Don’t you just love the color and finish! I am really crushing on this piece! 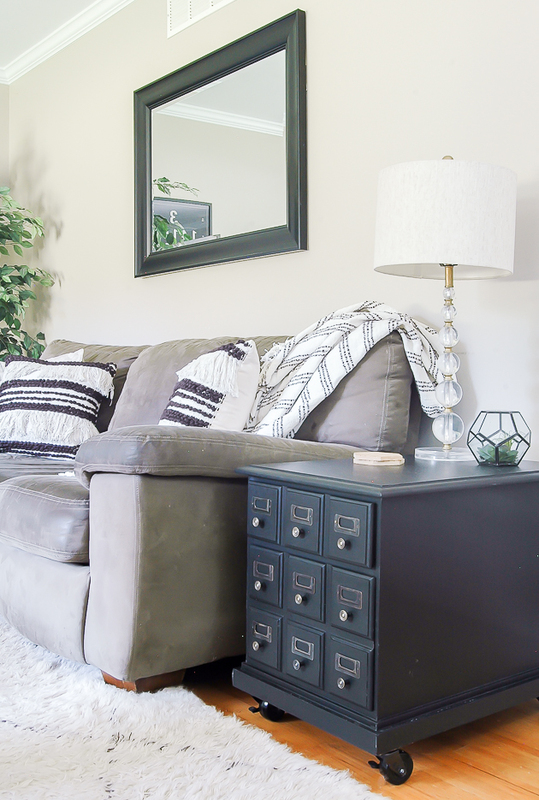 You have to see how a $15 Goodwill End Table was stylized into this Farmhouse Card Catalog Masterpiece. 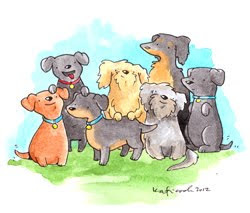 Just click on over to Little House Of Four and you will see that it is not as difficult as you might think. Keep your eyes peeled for items that all ready have squares as a part of their design…the rest… Cake! Enjoy your visit. Dear Andrea, I have been enjoying your emails filled with articles and pictures that make my fingers itch to work on another project. Thank you and all your contributors. I originally found you via Pinterest and happily downloaded some calendars, thank you very much. Love these, Andrea! I so would like to find a piece like the Wood Spa shared. So pretty! Hi there Melissa! Your makeover is so fabulous! It was my honor : ) Here’s wishing you a fabulous day… hugs!